Rock-solid 13% returns or a high-risk gamble with a slim possibility of exciting gains? Here's how to make that choice. If you're looking for investment options in the Internet of Things (IoT) market, the sector's best-known names would certainly include InvenSense (NYSE:INVN) and NXP Semiconductors (NASDAQ:NXPI). In its recently reported third quarter, NXP derived 24% of its revenue from IoT-oriented products. InvenSense is betting the entire farm on sensor systems for network-connected devices. But it's actually an apples-and-oranges contest in many ways, particularly since NXP accepted a game-changing buyout offer from Qualcomm (NASDAQ:QCOM). So which one of these IoT specialists should you buy today -- InvenSense or NXP? With NXP, you know what you're likely to get. The end game will probably be an all-cash payout of $110 per share from Qualcomm, as that chip giant doubles down on NXP's automotive computing and Internet of Things expertise. The deal is not likely to fall apart, because the two companies have very few markets in common and Qualcomm has the financial foundation to get this $47 billion deal done. Therefore, NXP investors are staring down a near-certain 13% return over the next 12 to 14 months. That's a respectable gain no matter how you slice it, and only more attractive in the light of the low risk involved. So unless you have some unique insight into the NXP-Qualcomm combination that points to a breakup at the altar, NXP represents a rock-solid 13% return in the next year or so. If you think that InvenSense will do better, go with the sensor specialist. Otherwise, stick with NXP for now and get ready to reinvest the cash payment into Qualcomm or InvenSense near the end of 2017. The company has always balanced on the edge of high unit sales volume and low profit margins, and was not prepared for a downturn in the critical smartphone and tablet markets. Can InvenSense engineer a turnaround from this trough, or will share prices only sink further? I don't have a solid answer to that question. 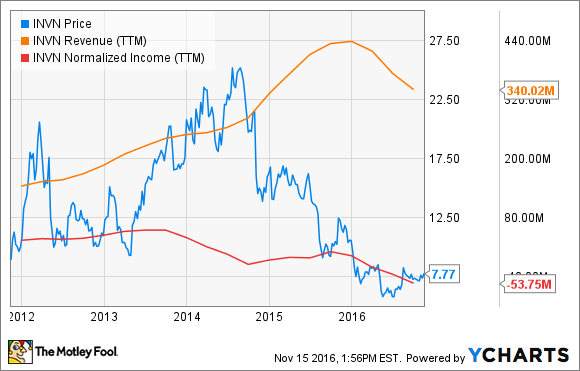 At best, InvenSense is a high-risk gamble at this point. The promise of exciting returns on the way up from these dark days might convince you to stick on this side of the fence, or maybe make start a smaller, totally speculative position in InvenSense while finding safer havens for most of your nest egg. And that's exactly what NXP Semiconductors can offer at this point.